IWEco, Integrating Water, Land and Ecosystems Management in Caribbean Small Island Developing States, is a new project which will inject 20 million dollars into five OECS nations. The participating OECS countries are Antigua & Barbuda, Grenada, St. Kitts & Nevis, Saint Lucia, and St. Vincent & the Grenadines. According to Lorna Inniss, Coordinator for IWEco on behalf of the United Nations, Montserrat is excluded as it is considered a developed nation based on its ties to the United Kingdom. 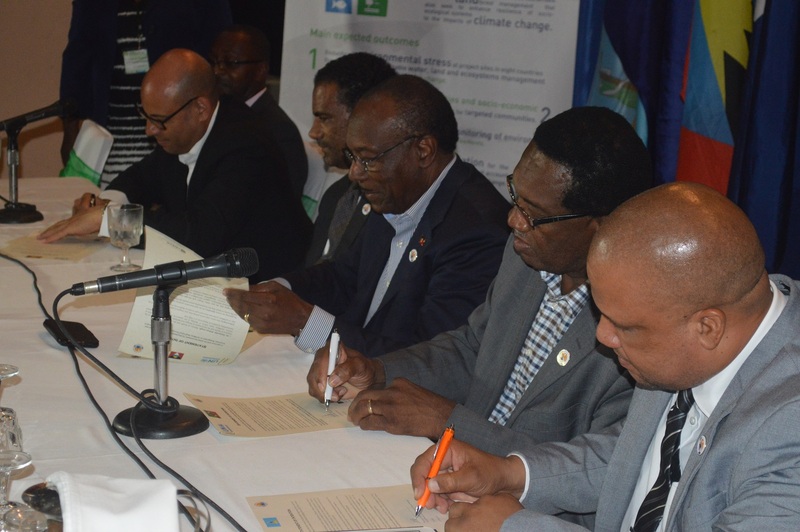 Representatives of the ministers of environment who met on Montserrat for COMES5 on July 10 – 11, signed the statement of intention. The intention acknowledges that “more cooperation, partnership and integrated approaches are needed if the state of Caribbean ecosystems, land and water resources, biodiversity are to improve; and the region’s heavy dependence on land and water resources and the biodiversity within, and the extent to which they are threatened by unsustainable development. Each nation must in collaboration with a local project implement an integrated approach to fresh and coastal water resources management, sustainable land management and sustainable forest management, while also seeking to enhance resilience of socio-ecological systems to the impacts of climate change. The signing ministers were Hon. Simon Stiel of Grenada, Hon. Molywn Joseph of Antigua & Barbuda, Hon. Eugene Hamilton of St Kitts & Nevis and Hon. Herod Stanislas of St Lucia. Antigua & Barbuda through the Ministry of Health and Environment will receive a total of $3,812,323 USD for a project focused on land degradation and effective land management through the development of innovative financing methodologies. St Kitts & Nevis through the Ministry of Sustainable Development on St Kitts and the Nevis Island Administration has been allocated $4,273,460 USD. They are currently revising the original project which was to address the impacts of Acute Land Degradation in the College Street Ghaut in St Kitts and Quarries and Sand Mining hotspots on Nevis. Saint Lucia’s funding of $2,205,446 USD will address problems of land degradation and ecosystem degradation in the Upper Reaches of the Soufriere Watershed. St Vincent and the Grenadines will use their $2.608,560 USD for addressing land degradation in the Georgetown Watershed on St. Vincent. The scope of this project is currently under revision. Grenada does not yet have a national sub-project for the IWEco and will benefit from support to strengthen policy, legislative and institutional frameworks, monitoring and evaluation and public awareness. The funding is a combination of grants and co-financing up to $20 million USD.